Oh my gosh guys. Half the year is gone. Whoosh!! I hope all of my U.S. peeps enjoyed a fun and safe holiday weekend. I was busy making video tutorials and packing up my house for the move at the end of the month. And, I was very happily busy testing out the vMix software for my online BlogAid Live shows. I’m moving my WPBlab show to Facebook Live on the BlogAid fan page. Subscribe to BlogAid Events on Facebook so you’ll always get notification of all shows, no matter what platform I’m using. I’m very excited about all I can now do with the vMix software, like screen sharing so I can do website reviews and on the spot tutorials. I’m not waiting on these video streaming platforms to give me the abilities I need most for my business. I’m being proactive by creating my opportunities. That’s why I invested in the vMix software, and why I’m looking into other streaming platforms too, like FireTalk. I’d like to invite you to do the same. Getting started is the biggest hurdle. And I’m making it super easy for you to get going with live streaming. No matter what may become of Facebook in the future, it is still one of the simplest platforms to cut your teeth on. I’ve got a whole course that walks you step-by-step from novice to pro with it too. And I just updated and added a bunch of videos to it as well! And I added a handy cheat sheet of the workflow I use to easily produce live streams that get noticed and convert. I’m already seeing the money coming in from doing these videos too. And my business continues to grow. You can too, if you’ll just take that first step. A lot of my clients have DIY and lifestyle blogs and y’all sure do make some pretty pictures for them too. So, my next course will be on how to create animated videos from those still shots. I believe you will find it super fun and creative. More on that when I get the course underway. But, right now I’m making new tutorials for my Webmasters Training courses. 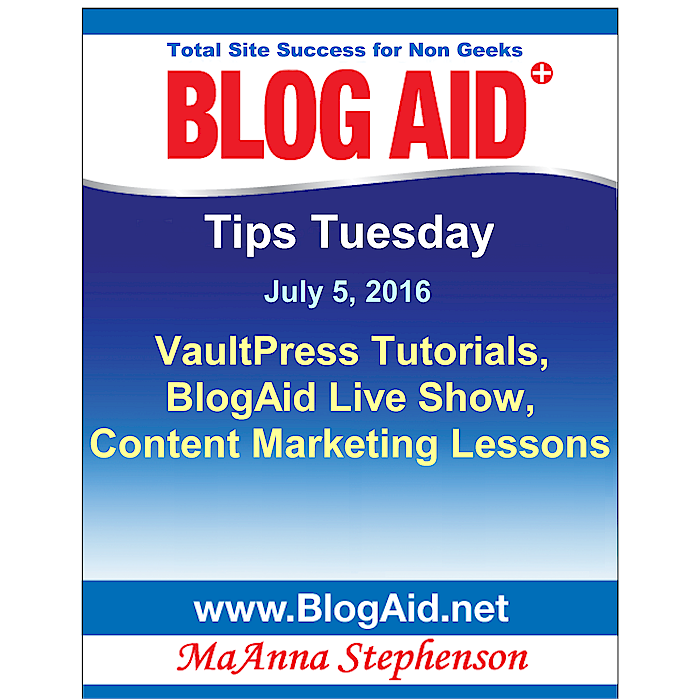 On tap are a series of videos for how to install and configure all parts of VaultPress. My goal is to have all those finished by the end of the week. If you’re a designer or VA who caretakes sites, these tutorials will give you the tech skills you’ve been missing. They will also build your confidence and you’ll be able to get jobs that you just couldn’t take before. Plus, you will be able to offer value-added services to your existing clients too. The courses literally pay for themselves. Just ask the webmasters already in it. And, we have a private FB group where we can ask questions and support one another too. There are TONS of free themes in the WordPress repository. The Review Team has decided that they need to develop a new action plan to sort the good from the bad. Then slide the themes that do have those issues to a second tier of reviewers to dig deeper. Hopefully this will help them approve more themes faster that do pass muster. While the free themes have certainly improved radically in function over the past couple of years, to me, the overwhelming majority of them will never match the clean code and functionality of Genesis. And that’s why I still use and recommend it to all of my clients. For those of you using WooThemes, you may have noticed that the WooThemes.com link now redirects to WooCommerce.com. I just love the Foo Gallery plugin. I use it on my carving site. Well, now Adam Warner has released an update to the FooGrid template, which helps you lay out all of those pretty images in a sweet grid. The plugin can now work with external links. So, if you’re bringing in images from other platforms, they can populate in the grid layout. Nice, huh? I know some of you lifestyle bloggers are going to want to check that out. Did you take a break from blogging over the long holiday weekend? Do you ever get a week or two away from working on your site? This post by Elvis Michael over on the BloggingPro site has several good tips for ways to work smarter, not harder, so you can free up more of your time and not spend it all at your desk blogging. I haven’t been talking about blog content marketing for a while. And here’s why. Most all of the big content marketing sites have been talking about nothing else but video marketing too. That alone should tell you something about why I’m jumping up and down about it and making ways for you to get into video marketing right now too. On the most recent This Week in Content Marketing podcast, Joe Pulizzi talks about the changes Facebook is making right now. And he’s not being Chicken Little about the supposed downturn in reach from content on Facebook business pages either. At about 15 minutes into the show, he covers the 140 media companies and celebrities Facebook has contracted to bring high-quality videos to their new livestream services. He believes this is a strategic move on FB’s part to get brands hooked on video advertising. I’ve read report after report on how they are not making good use of it. My take is that FB will continue to push livestream content to the top for the next year or so. And those who are creating videos have a unique opportunity to be seen in ways that other content marketers just aren’t. While you’re over on the Content Marketing Institute blog, check out this breakdown by Michele Linn with 7 essential content marketing lessons from Rand Fishkin’s whiteboard Fridays. If you don’t know Rand, he’s one of the leading SEO dudes. Not everyone agrees with his conclusions, but you can certainly learn a LOT from his methodology. And I do mean a LOT. The post is all about creating exceptional content, which is worth a read all by itself. But, I want you to look at something else in the formatting of this post that I’m starting to see a whole lot of now. All through it are contextual links. Most are right in the paragraphs. But look at the ones they highlight as “handpicked related content.” They even break it out into its own highlight box. I assume that is blockquote styling, but they could have a special class of style for it. Y’all know that I was a long-time hold out on a fully responsive design. Losing link visibility to more of my content and conversion points was the main reason. And now with folks stripping down their blog posts for Instant Articles and Google AMP, putting highlighted links directly into the content stream is the only smart way to ensure more folks see more of your content. This is way more effective than that resource hog popular posts plugin you may be using. So, seriously consider making use of this technique to reduce your bounce rate, increase your time on site, and get more eyeballs on more of your stuff. For all of you who like to take photos on your phones, you’ll love this new feature from Facebook. You can turn a photo album into a neat slideshow. It even has free music for you to use. I’ve heard varying reports that you have to take 3-5 photos in a 24 hour period to make use of it, but I know those of you on trips and such this summer will have no problem meeting that requirement. Speaking of short videos, Carla Marshall at ReelSEO has a compilation of the best short videos on Instagram. Well worth a watch for inspiration. And you know that Instagram is owned by Facebook, right? See now why I’m making more video courses?